Just had to share this recipe, it was too good not to. E and I paid our usual Sunday morning visit to the farmers market last weekend and gathered an array of tasty veggies including sweet potatoes and leeks. I knew exactly what I was going to make. 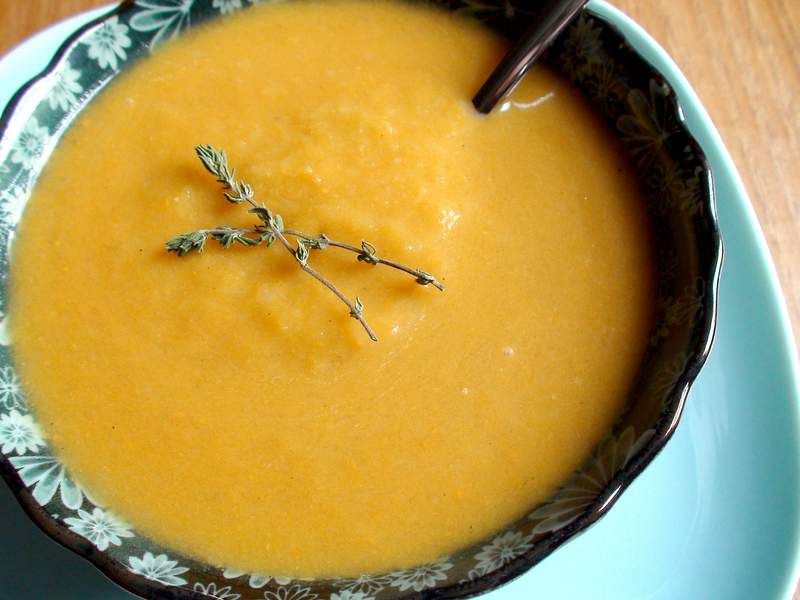 I’ve been making the same, simple and delish potato leek soup for years now so I figured substituting sweet potatoes would work just fine… and it did. Cut sweet potatoes into fourths. Cut leeks lengthwise and roughly chop. Clean them well once cut and pat dry. In a 3 quart pot, melt butter on medium and saute the leeks for about 7 minutes or until tender but not too browned. Add sweet potato and 4 cups broth. Bring to a boil and cover, reducing heat to a simmer. Cook for about 20 minutes or until sweet potatoes are soft. 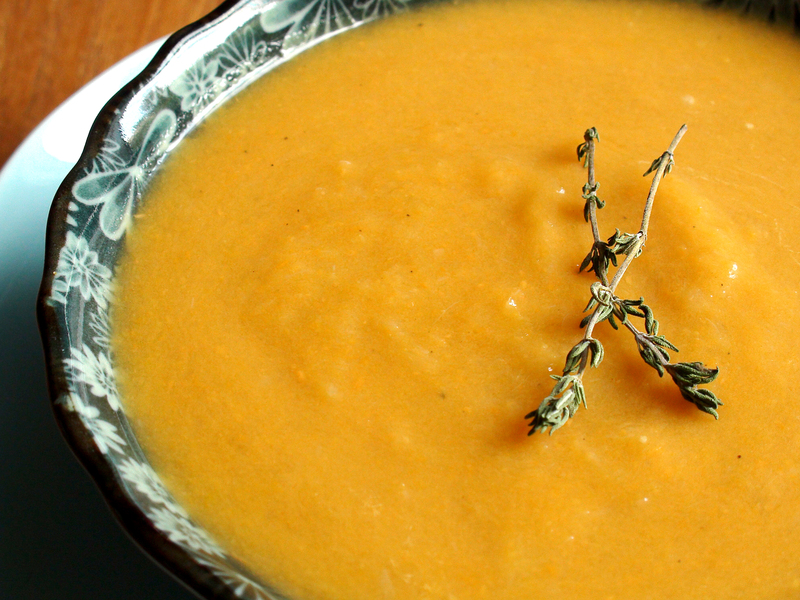 Using a hand blender (directly in the pot) or countertop blender, puree the leeks and sweet potatoes into a silky pulp. If the soup is too thick, add broth 1/4 cup at a time until you reach your desired consistency. Add salt and pepper to taste and voila, Sweet Potato Leek Soup. Super easy and super tasty. Enjoy! This looks sooooo good. I love sweet potatoes but I’ve never used them in a soup. Hi. 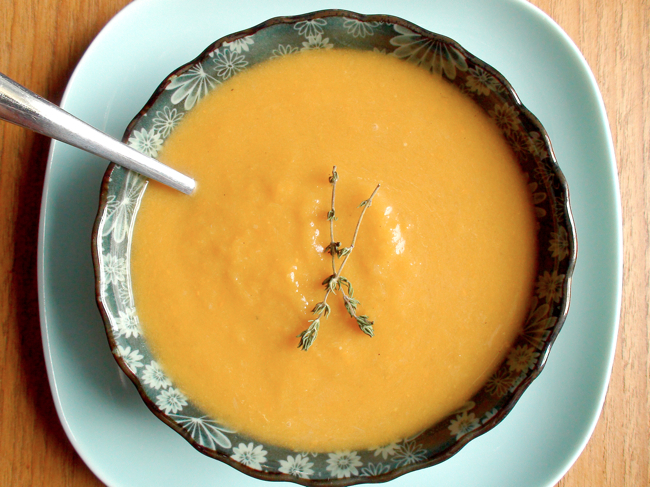 Yummy soup – Cheap and easy, but tastes rich and complicated! Mine lacked the rich orange colour shown in the photo. I was wondering if Yams could be used in lieu of sweet potatoes to help with the colour? I´m sure yams could be used in place of sweet potatoes or any other starchy root veggie. Try it out, I´d be curious to know how it goes! My leeks are sauteeing right now. Thanks for the super-simple recipe. Yum! I hope you like it. 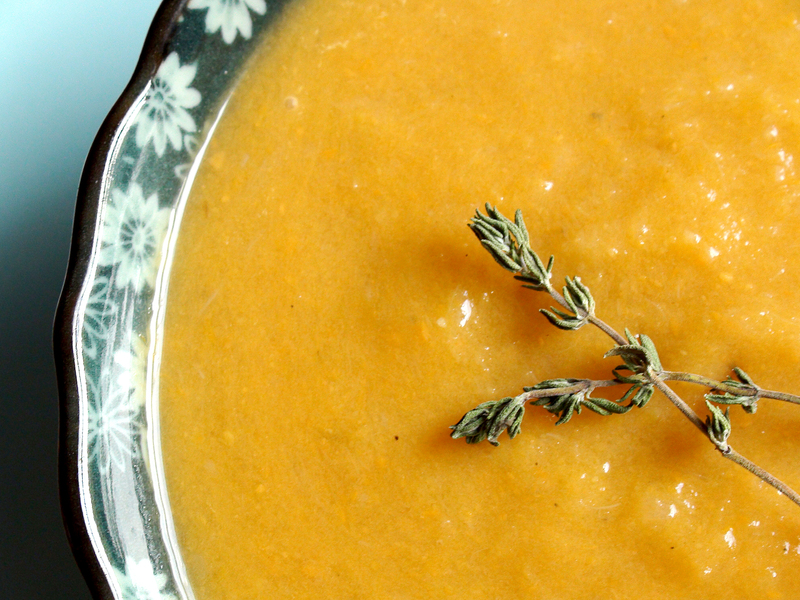 Sweet potato leek soup is one of my faves! What an easy recipe! Perfect for me to serve at my thanksgiving dinner! Thanks a lot for sharing! This is one of my favorite recipes, I make it all the time!! It would be wonderful for Thanksgiving!